Just a quick example of what the app can do. One of the difficult aspects of having public discussions about projects like the Madison Ave Road Diet is that it's hard for non planners/engineers to explicitly show what they'd like to see (it's true of building projects, too). And, maybe as a result, the discussion ends up being centered around what people don't want. So this web app looks like it could be interesting and helpful: ReStreet allows anyone to plan the design of a street, laying out sidewalks, bike lanes, vehicle travel lanes, transit lanes, whatever. And then you can share the design with other people. 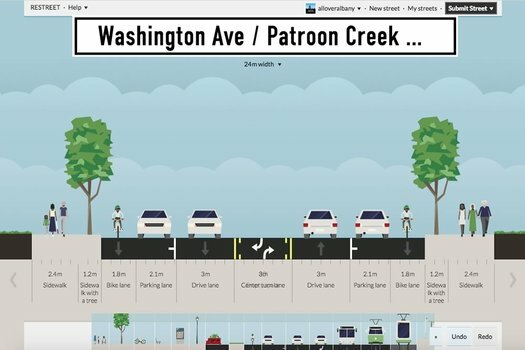 That image above is a screengrab of a sample design that we worked up this afternoon for upper Washington Ave in Albany. * The design includes wide sidewalks, protected bike lanes, a single travel lane in each direction, and middle turn lane. What we like about this app is that it enables members of the public to essentially say "more like this," which seems like a path toward more productive discussion. So go give it a try. * Why upper Washington Ave? We've been thinking about it because the Capital District Transportation Committee, city of Albany, and UAlbany have been laying the groundwork to study the corridor in order to possibly change the design to better fit the recently lowered speed limit there. I can understand why one may want to lower a speed limit on a residential street but a throughfare that was built like a thoroughfare needs to do it's job. The private dormitory that made that stretch of Washington "residential" shouldn't been built there to begin with. They plopped a residential building on a tiny piece of land between two highways and it's out of place there in many ways. It would be interesting to investigate who approved that construction. @Lu - I guess it depends on quite a few things. Regardless of usage though, the route should convey multi-modal traffic safely. Mixed-use areas benefit from lower speeds too, not just residential neighborhoods. As far as being a main thoroughfare, 90 and 85 are available to move high-speed, high-volume traffic through the area, and serve the main campuses (SUNY, Harriman) directly. There is absolutely no need for there to be (in places) 6 driving & turn lanes on Washington. >>There is absolutely no need for there to be (in places) 6 driving & turn lanes on Washington. I used to drive there daily and believe me, those lanes are in use. Plopping a residential building at the wrong neighborhood and then moaning that the whole neighborhood doesn't fit that one building is backwards. It reminds me of a reason why right-to-farm laws exist. Lu, I disagree with your square peg-round hole assessment; if you are only seeing one residential building, you are missing a lot. As a former student of SUNY Albany and someone who works on the state campus, this stretch has significantly built up over the past 10 years, with a large influx of pedestrian traffic that eats lunch, frequents the farmers markets, lives, studies and works in the area, who do not use cars. As someone who presently uses this stretch by bus, there are a ton of students and folks who work in the various office buildings who need to cross this road. I only see this trend growing in this corner as it becomes more dense, utilizes its advantage of being close to I-90 and 85, and helps relieve pressure on other neighborhoods by offering more residential options close to where folks study and work. In the hey-day we probably could have gotten away with allowing cars to dominate this stretch, but itâ€™s now important that our transit infrastructure become more multi-modal to meet the diversifying needs of this corridor. In the past year, I have not noticed any difference in my travel time by bus, or if I happen to use my car, along this stretch since the decrease in speed. Spatially, Iâ€™ll give it to you that it seems like you are going at a snailâ€™s pace, but that is because the road design induces a need to speed (and that should change). Temporally, Iâ€™m still getting to Point B from Point A at the same time in my experience. If anything, itâ€™s the signaling that needs better coordination on this corridor, not more speed, to help relieve traffic during peak hours. Total tangent, but apparently the Governor doesnâ€™t get this either when trying to privatize the Northeast corner of the state campus, when the RFP forbid mix-use development and no residential components. The Alexander (professional crowd) and the Aspen (students), both see these trends and we should be encouraging more dense residential development alongside major job centers.